Part one introduces the notion of path symmetry: a property of uniform-cost grid maps which can significantly slow down search. 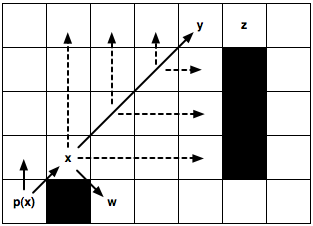 Part two discusses Rectangular Symmetry Reduction (RSR) : a simple yet effective preprocessing algorithm that eliminates many path symmetries by decomposing a grid map into a set of empty rectangles. In this article I describe Jump Point Search (JPS) : an online symmetry breaking algorithm which speeds up pathfinding on uniform-cost grid maps by “jumping over” many locations that would otherwise need to be explicitly considered. JPS is faster and more powerful than RSR: it can consistently speed up A* search by over an order of magnitude and more. Unlike other similar algorithms JPS requires no preprocessing and has no memory overheads. Further, it is easily combined with most existing speedup techniques — including abstraction and memory heuristics. Please note: this work was developed in conjunction with Alban Grastien. It forms part of my doctoral research into pathfinding at NICTA and The Australian National University. Electronic copies of the paper in which this idea was first described are available from my homepage. This section and the next describe the mechanical details and algorithmic properties of Jump Point Search. If you don’t care for such things, feel free to jump ahead and check out some screenshots. JPS  can be described in terms of two simple pruning rules which are	applied recursively during search: one rule is specific to straight steps, the other for diagonal steps. The key intuition in both cases is to prune the set of immediate neighbours around a node by trying to prove that an optimal path (symmetric or otherwise) exists from the parent of the current node to each neighbour and that path does not involve visiting the current node. Figure 1 outlines the basic idea. Node x is currently being expanded. The arrow indicates the direction of travel from its parent, either straight or diagonal. In both cases we can immediately prune all grey neighbours as these can be reached optimally from the parent of x without ever going through node x. We will refer to the set of nodes that remain after pruning as the natural neighbours of the current node. These are marked white in Figure 1. Ideally, we only ever want to consider the set of natural neighbours during expansion. However, in some cases, the presence of obstacles may mean that we need to also consider a small set of up to k additional nodes (0 ≤ k ≤ 2). We say that these nodes are forced neighbours of the current node. Figure 2 gives an overview of this idea. Node x is currently being expanded. The arrow indicates the direction of travel from its parent, either straight or diagonal. Notice that when x is adjacent to an obstacle the highlighted neighbours cannot be pruned; any alternative optimal path, from the parent of x to each of these nodes, is blocked. We apply these pruning rules during search as follows: instead of generating each natural and forced neighbour we instead recursively prune the set of neighbours around each such node. Intuitively, the objective is to eliminate symmetries by recursively “jumping over” all nodes which can be reached optimally by a path that does not visit the current node. We stop the recursion when we hit an obstacle or when we find a so-called jump point successor. Jump points are interesting because they have neighbours that cannot be reached by an alternative symmetric path: the optimal path must go through the current node. The details of the recursive pruning algorithm are reasonably straightforward: to ensure optimality we need only assign an ordering to how we process natural neighbours (straight steps before diagonal). I will not attempt to outline it further here; the full details are in the paper and my aim is only to provide a flavour for the work. Figures 3 gives two examples of the pruning algorithm in action. In the first case we identify a jump point by recursing straight; in the second case we identify a jump point by recursing diagonally. Figure 3: Jumping Examples. Node x is currently being expanded. p(x) is its parent. (a) We recursively apply the straight pruning rule and identify y as a jump point successor of x. This node is interesting because it has a neighbour z that cannot be reached optimally except by a path that visits x then y. The intermediate nodes are never explicitly generated or even evaluated. (b) We recursively apply the diagonal pruning rule and identify y as a jump point successor of x. Notice that before each diagonal step we first recurse straight (dashed lines). Only if both straight recursions fail to identify a jump point do we step diagonally again. Node w, which is simply a forced neighbour of x, is generated as normal. It requires no extra-memory overheads. It can consistently speed up A* search by over 10 times; making it not only competitive with, but often better than, approximate techniques such as HPA* . Properties 1-3 are interesting theoretical results, and rather surprising, but I will not address them further here. My main objective in this article is simply provide a flavour for the work; for a full discussion, including proofs, please see the original paper . Property 4 is perhaps of broadest practical interest so I will give a short summary of our findings below. We evaluated JPS on four map sets taken from Nathan Sturtevant’s freely available pathfinding library, Hierarchical Open Graph. Two of the benchmarks are realistic, originating from popular BioWare video games Baldur’s Gate II: Shadows of Amn and Dragon Age: Origins. The other two Adaptive Depth and Rooms are synthetic though the former could be described as semi-realistic. In each case we measured the relative speedup of A* + JPS vs. A* alone. Briefly: JPS can speed up A* by a factor of between 3-15 times (Adaptive Depth), 2-30 times (Baldur’s Gate), 3-26 times (Dragon Age) and 3-16 times (Rooms). In each case the lower figure represents average performance for short pathfinding problems and the higher figure for long pathfinding problems (i.e. the longer the optimal path to be found, the more benefit is derived from applying JPS). What makes these results even more compelling is that in 3 of the 4 benchmarks A* + JPS was able to consistently outperform the well known HPA* algorithm . This is remarkable as A* + JPS is always performing optimal search while HPA* is only performing approximate search. On the remaining benchmark, Dragon Age, we found there was very little to differentiate the performance of the two algorithms. Caveat emptor: It is important to highlight at this stage that A* + JPS only achieves these kids of speedups because each benchmark problem set contains a large number of symmetric path segments (usually manifested in the form of large open areas on the map). In such cases JPS can exploit the symmetry and ignore large parts of the search space. This means A* both generates and expands a much smaller number of nodes and consequently reaches the goal much sooner. When there is very little symmetry to exploit however we expect that our gains will be more modest. Below in Figure 4 are screenshots of A* + JPS in action. In each case tiles marked red must be explored in order to find the optimal solution (marked in blue). For comparison, I also show the number of tiles explored by A* + RSR and vanilla A* when solving the same problem instances. Figure 4: Search Effort. Comparative pathfinding examples from our experimental results. Images in the first column show total nodes expanded by A* (marked red) in order to find the optimal path to the goal (marked blue). Images in the middle and last columns are total nodes expanded by A* + RSR and A* + JPS respectively. Notice that A* + JPS ignores many symmetric	path segments (more than A* + RSR even) and typically reaches the goal with much less effort. The explicit identification and elimination of symmetries in pathfinding domains is an idea that until now has received little attention in the academic literature. Approaches for dealing with symmetry, such as Jump Point Search, provide us with powerful new tools for reducing the size of explicit regular search spaces. By eliminating symmetry we speed up not just A* but entire classes of similar pathfinding algorithms. Also, consider: JPS is entirely orthogonal to almost every other speedup technique applicable to grid maps. Thus, there is no reason why we couldn’t combine it, or other similar methods, with hierarchical pathfinding approaches, memory heuristics or even other optimality-preserving state-space reduction	techniques. 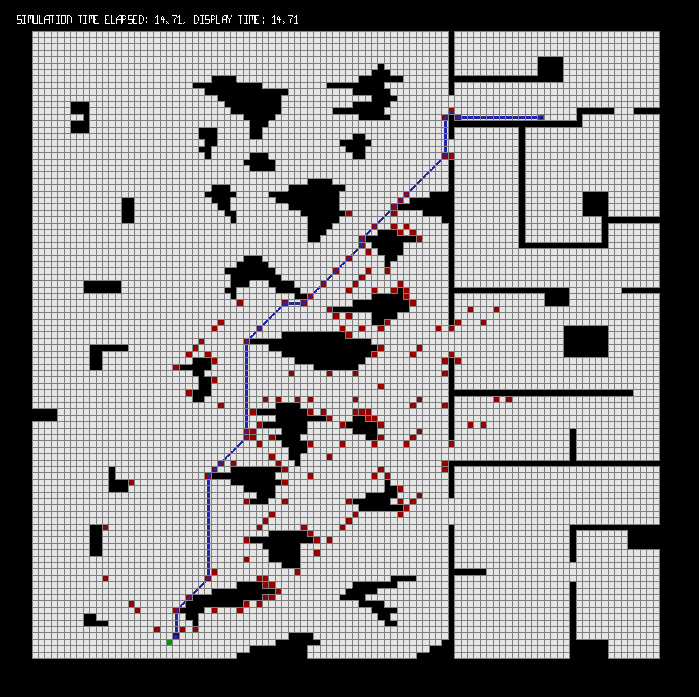 That means the results presented thus far are only the tip of the iceberg in terms of performant grid-based pathfinding methods. Another exciting aspect of this work is the possibilities it opens for further research. For example: could we pre-process the map and go even faster? Or: are there analogous jumping rules that one could develop for weighted grids? What about other domains? Could we apply the lessons learned thus far to help solve other interesting search problems? The answers to the first two questions already appear to be positive; the third is something I want to explore in the near future. Regardless of how it all turns out, one thing is certain: it’s an exciting time to be working on pathfinding! A. Botea, M. Müller, and J. Schaeffer. Near Optimal Hierarchical Path-finding. In Journal of Game Development (Issue 1, Volume 1), 2004. D. Harabor, A. Botea, and P. Kilby. Path Symmetries in Uniform-cost Grid Maps. In Symposium on Abstraction Reformulation and Approximation (SARA), 2011. D. Harabor and A. Grastien. 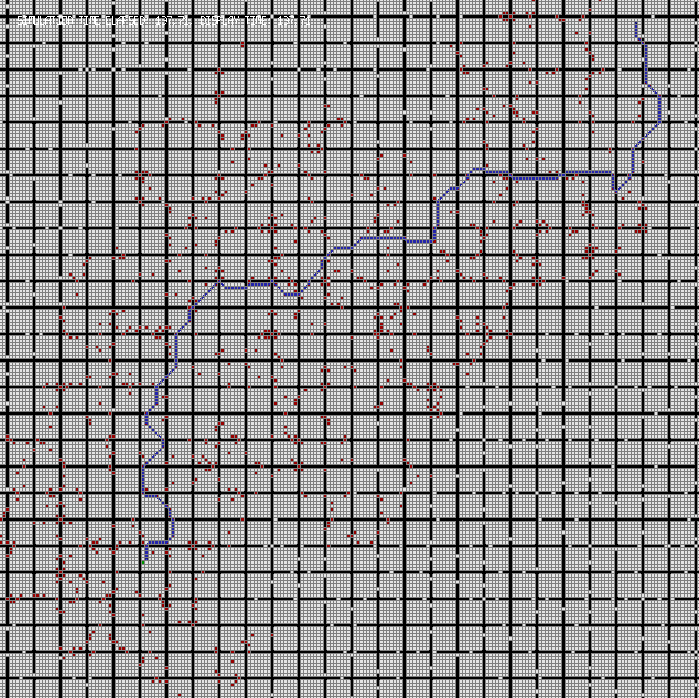 Online Graph Pruning for Pathfinding on Grid Maps. In National Conference on Artificial Intelligence (AAAI), 2011. This is the second of my three-part look into symmetry reduction algorithms for speeding up grid-based pathfinding. In part one I introduced the notion of path	symmetry: a property of uniform-cost grid maps which can	significantly slow down optimal search. In this article I discuss Rectangular Symmetry Reduction (RSR for	short): a new pre-processing algorithm that explicitly identifies and eliminates symmetries from uniform cost grid maps. RSR   is simple to understand, quick to apply and has low memory overheads. 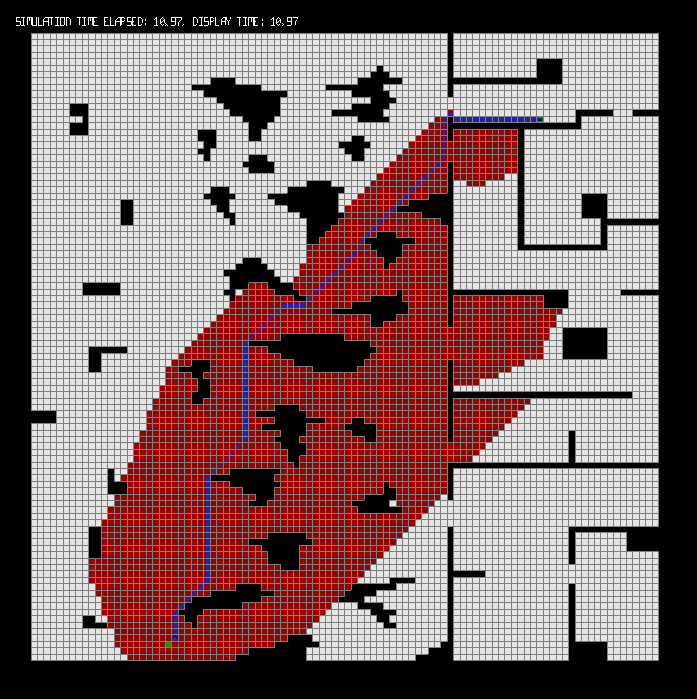 When combined with a standard search algorithm, such as A*, RSR can speed up optimal pathfinding by anywhere from several factors to an order of magnitude. These characteristics make RSR highly competitive with, and in many cases better than, competing state-of-the-art search space reduction techniques. Please note: this work was developed in conjunction with Adi Botea and Philip Kilby. It forms part of my doctoral research into pathfinding at NICTA and The Australian National University. Electronic copies of the papers in which these ideas were first described are available from my homepage. 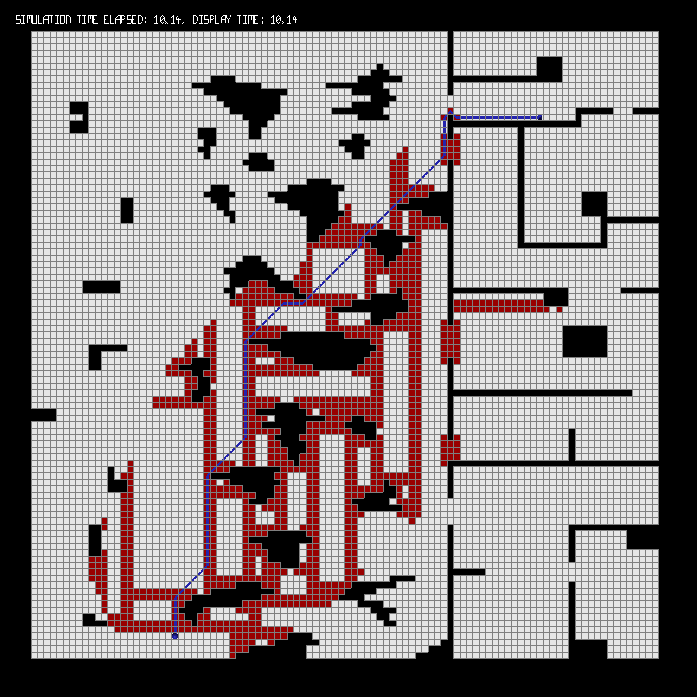 RSR speeds up optimal pathfinding by decomposing an arbitrary uniform-cost grid map into a set of empty rectangles. The idea is to avoid symmetries during search by only ever expanding nodes from the perimeter of each empty rectangle, and never from the interior. To ensure optimal travel through each rectangle we will also add a series of macro edges that allow units to “jump” from one side of a rectangle’s perimeter to the directly opposite side. RSR can be described in 3 simple steps. 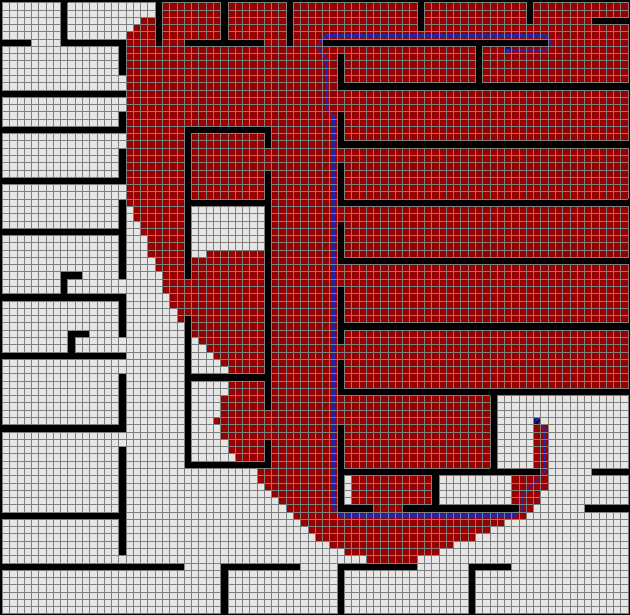 Steps 1 and 2 are applied offline; their objective is to identify and prune symmetry from the original grid map. The third step is an online node insertion procedure; its objective is to preserve optimality when searching for paths in the symmetry-reduced grid map. 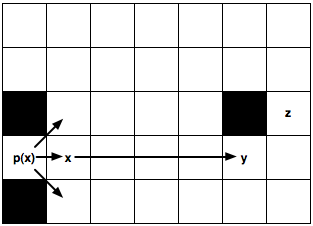 Decompose the grid map into a set of obstacle-free rectangles. 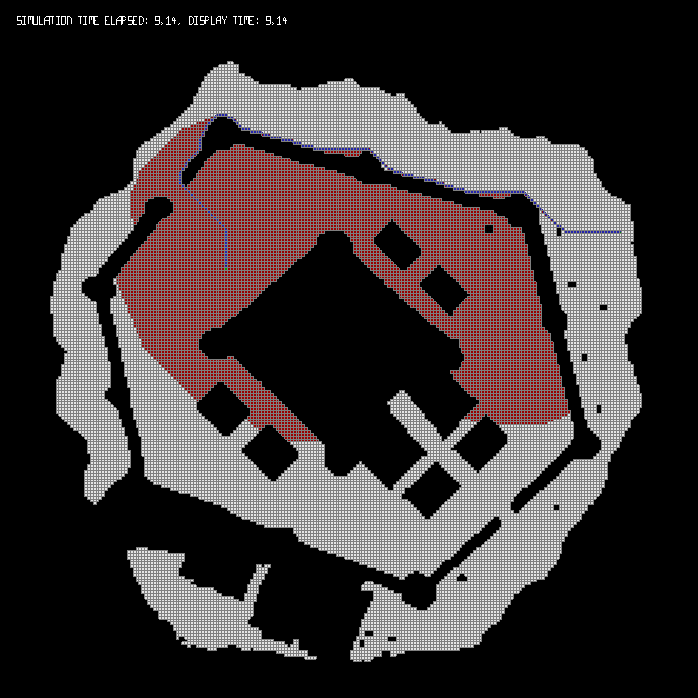 The size of the rectangles can vary across a map, depending on the placement of the obstacles. Once the decomposition is complete, prune all nodes from the interior, but not the perimeter, of each empty rectangle. Add a series of macro edges that connect each node on the perimeter of a rectangle with other nodes	from the perimeter. In a 4-connected map (shown here for simplicity) a single macro edge between nodes on opposite sides of each rectangle will suffice. If diagonal moves are allowed, a set of macro edges (as described in ) will be needed instead. When the start or goal is located in the interior of an empty rectangle, we use a temporary node re-insertion procedure. In a 4-connected map (shown here for simplicity) we connect the temporary node, online, to the 4 nearest perimeter nodes. A similar operation, involving sets of edges from each perimeter side, is used when diagonal moves are allowed. It has a small memory overhead in practice. Node insertion (Step 3) can be performed in constant time. It can speed up A* search by anywhere from several factors to an order of magnitude. I will focus on points 2 and 4 in the remainder of this section. A thorough discussion of points 1 and 3 (including proofs) can be found in . In the most straightforward implement of RSR we need to store the id of	the parent rectangle for each of the n traversable nodes in the original grid. We also need to store the origin and dimensions of each rectangle (macro edges can be identified on-the-fly and do not need to be stored explicitly). This means that, in the worst case, we might need to store up to 5n integers. In practice however we can usually do much better. For example: there is little benefit in storing or assigning nodes to rectangles with few or no interior nodes (1×1, 2×1, 2×2, 3×2, 3×3 etc.). We can also avoid the parent id overhead altogether and only store the set of identified rectangles. The only downside is that, during insertion (Step 3 above), we now need to search for the parent rectangle of the start and goal — instead of being able to identify it in constant time. We evaluated RSR on a number of benchmark grid map sets taken from Nathan Sturtevant’s freely available pathfinding library, Hierarchical Open Graph. One of the map sets is from the game Baldur’s Gate II: Shadows of Amn. The other two map sets (Rooms and Adaptive Depth) are both synthetic, though the latter could be described as semi-realistic. I will give only a short summary of our findings; full results and discussion is available in the following papers:  . In short: we observed that in most cases RSR can consistently speed up A* search by a factor of between 2-3 times (Baldur’s Gate), 2-5 times (Adaptive Depth) and 5-9 times (Rooms). In some cases the gain can be much higher: up to 30 times. We found that the extent of the speed gains will be dependent on the topography of the underlying grid map. On maps that feature large open areas or which can be naturally decomposed into rectangular regions, RSR is highly effective. When these conditions do not exist, the observed speed gains are more modest. This performance is competitive with, and often better than, Swamps ; another state-of-the-art search space reduction technique. We did not identify a clear winner (each algorithm has different strengths) but did notice that the two methods are orthogonal and could be easily combined. Below are screenshots of A* + RSR in action. In each case tiles marked red must be explored in order to find the optimal solution (marked in blue). For comparison, I also show the number of tiles explored by vanilla A* when solving the same problem instances. I give one example problem from each benchmark set. You can click on each image to make it larger. 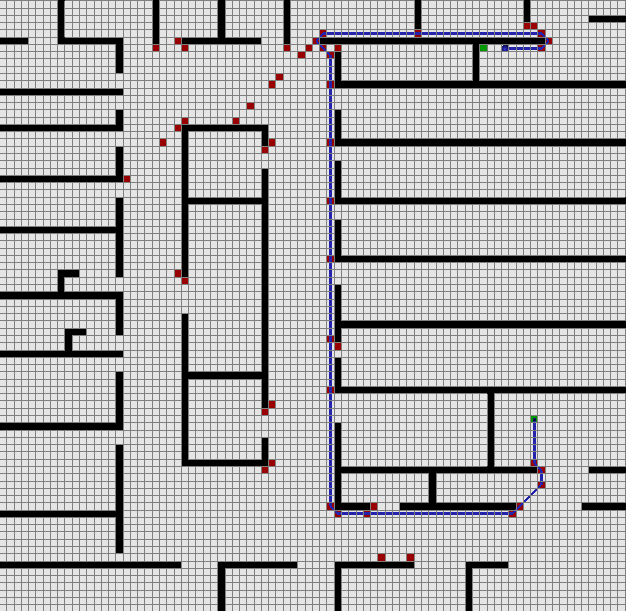 Comparative pathfinding examples from our experimental results. Images (a) to (c) are total nodes expanded by A* in order to find the optimal path to the goal (marked blue). Images (d) to (f) are total nodes expanded by A* + RSR. 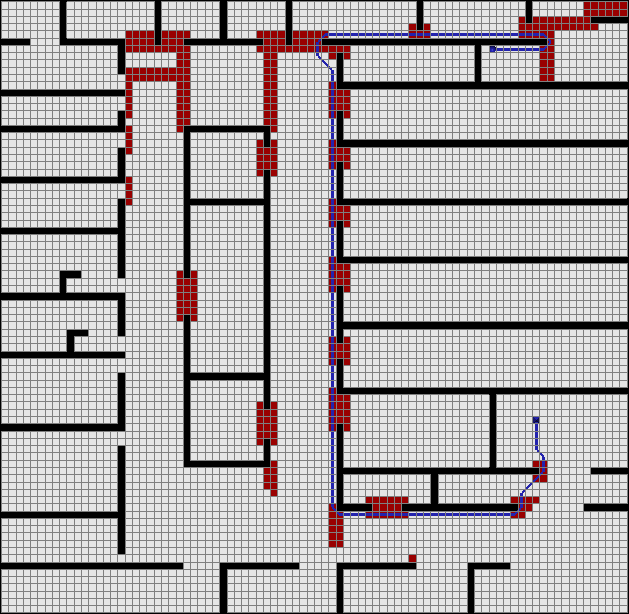 The respective domains are (from left to right): Baldur’s Gate, Adaptive Depth and Rooms. Notice that A* + RSR ignores many symmetric path segments and typically reaches the goal with much less effort. In the final part of this series I will discuss Jump Point Search : a similar-yet-different symmetry breaking technique which builds on some of the ideas introduced here. Like RSR, Jump Point Search is highly effective and simple to apply; unlike RSR it can be applied online and has no memory overhead and no pre-processing requirements. In most cases, JPS is also faster than RSR. Stay tuned for that! D. Harabor and A. Botea. Breaking Path Symmetries in 4-connected Grid Maps. In AAAI Conference on Artificial Intelligence and Interactive Digital Entertainment (AIIDE), 2010. N. Pochter, A. Zohar, J. S. Rosenschein and A. Felner. Search Space Reduction Using Swamp Hierarchies. In National Conference on Artificial Intelligence (AAAI), 2010. In this article, the first in a three-part series, I attempt to explain path symmetry: a property of uniform-cost grid maps and other regular search domains which can significantly slow down pathfinding. I describe how symmetry manifests itself and briefly discuss some approaches that other people have tried to improve things. Finally, I introduce two recent ideas from my doctoral research: Rectangular Symmetry Reduction (RSR) and Jump Point Search (JPS). Both are optimality-preserving techniques that explicitly identify and eliminate symmetry in order to speed up pathfinding by an order of magnitude and more. In parts two and three I will give a technical overview of both RSR and JPS, discussing their strengths, weaknesses and observed performance on two popular video-game benchmarks kindly made available by Nathan Sturtevant and BioWare: Baldur’s Gate II and Dragon Age: Origins. Please note: this work was developed in conjunction with my co-authors: Adi Botea, Alban Grastien and Philip Kilby. It forms part of my doctoral research into pathfinding at NICTA and The Australian National University. Electronic copies of the papers mentioned in this article are available from my homepage. 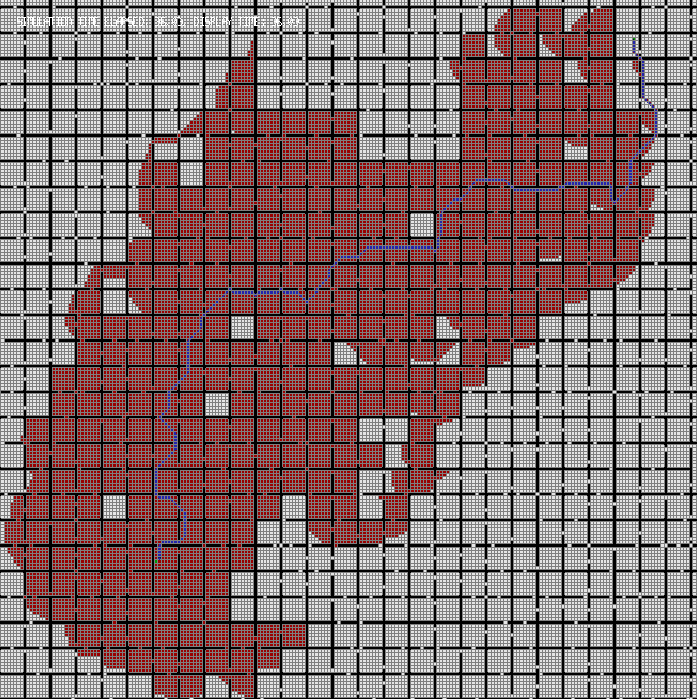 Often appearing as a pathfinding domain in areas such as robotics and video games, grid maps are a simple yet popular method for representing an environment. As it turns out, grids are also academically interesting for the following reason: between any given pair of locations, there usually exists many possible paths. Sometimes these paths represent alternative ways of reaching one location from the other but more often they are symmetric in the sense that the only difference between them is the order in which moves appear. 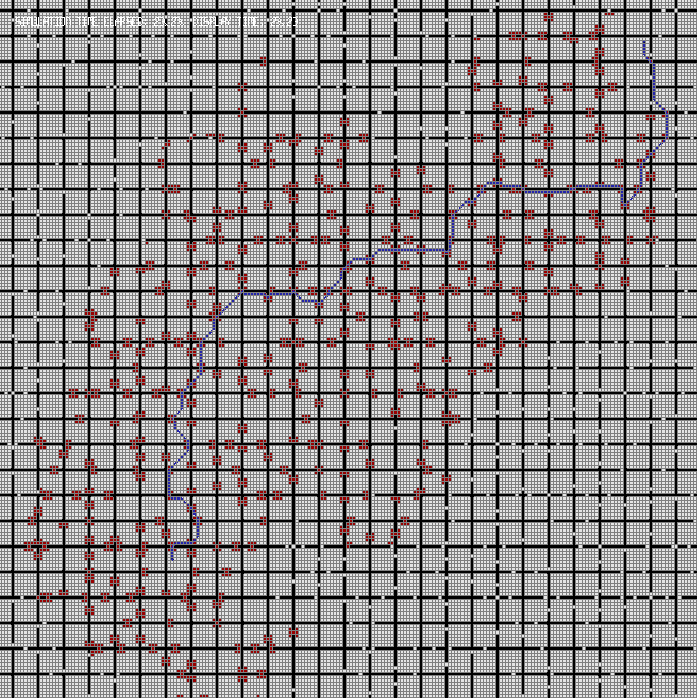 A simple grid-based pathfinding problem. For simplicity (but not in general) we allow only straight moves and not diagonal. Many optimal length paths could be returned as the solution; we highlight only a few. Notice that each one is a permutation of all the others. In such cases we say that a symmetry exists between the paths. A path in a grid map is an ordered sequence of vectors, where each vector represents a single step from one node on the grid to an adjacent neighbouring node. The distinction between edges and vectors is an important one as it allows us to distinguish between paths that are merely equivalent (i.e. of the same length) and those which are symmetric. But what, exactly, does it mean to have a symmetric relationship between paths? Two grid paths are symmetric if they share the same start and end point and one can be derived from the other by swapping the order of the constituent vectors. As a clarifying example, consider the problem instance in Figure 1. 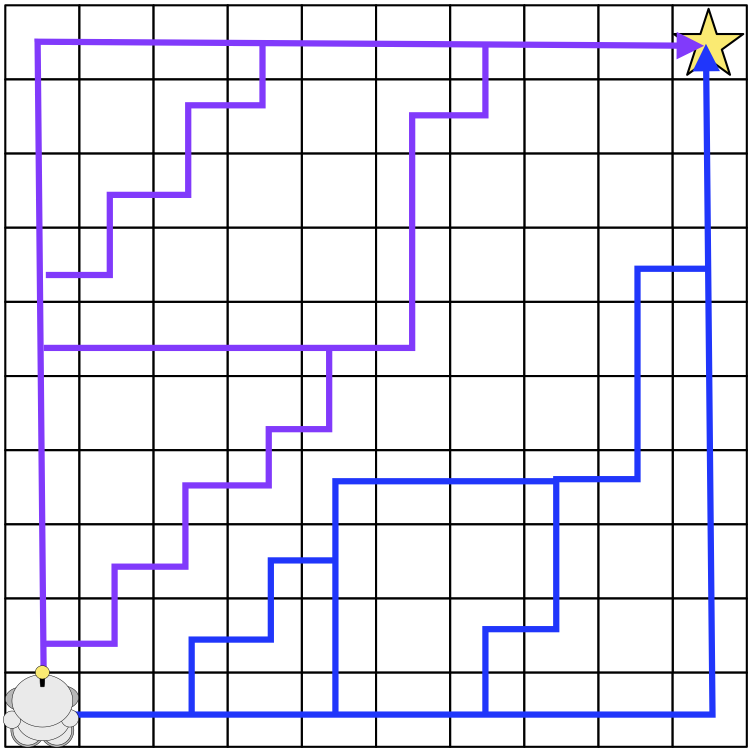 Each highlighted path is symmetric to the others since they all have the same length and they all involve some permutation of 9 steps up and 9 steps right. In the presence of symmetry a search algorithm such as A* is forced to explore virtually every location along each optimal path. In Figure 1, depending on how we break ties, A* might expand every node on the entire map before reaching the goal. Further, A* will usually consider many other nodes that appear promising but that are not on any optimal path. For example, each time A* expands a node from the fringe of the search, it has already likely found almost every symmetric shortest path leading to that node (again, depending on how we break ties when two nodes appear equally good). But this effort is in vain if these expansions do not lead the search closer to the goal and instead into a dead-end. Thus arises the question which I will attempt to answer in this article: how do we deal with symmetry when pathfinding on grid maps? Reducing the size of the search space through abstraction. Algorithms of this type are fast and use little memory but compute paths which are usually not optimal and must be refined via further search. Typical examples: HPA* , MM-Abstraction . Improving the accurary of heuristic functions that guide search. Algorithms of this type usually pre-compute and store distances between key pairs of locations in the environment. Though fast and optimal, such methods can incur signficant memory overheads which is often undesirable. Typical examples: Landmarks , True Distance Heuristics . Dead-end detection and other state-space pruning methods. Algorithms of this type usually aim to identify areas on the map that do not need to be explored in order to reach the goal optimally. Though not as fast as abstraction or memory heuristics, such methods usually have low memory requirements and can improve pathfinding performance by several factors. Typical examples: Dead-end Heuristic , Swamps , Portal Heuristic . My work in this area can be broadly classified as a search space pruning technique. Where it differs from existing efforts is that, instead of trying to identify areas that do not have to be crossed during search, I aim to identify and prune symmetric nodes that prevent the fast exploration of an area. This idea nicely complements existing search-space reduction techniques and, as it turns out, also complements most grid-based abstraction methods and memory heuristic approaches. RSR  can be described as a pre-processing algorithm which identifies symmetries by decomposing the grid map into empty rectangular regions. The central idea, then, is to avoid symmetries by only ever expanding nodes from the perimeter of each rectangle and never from the interior. JPS  consists of two simple neighbour pruning rules that are applied recursively during search. Each rule considers the direction of travel to a given node from its parent (either a straight	step or a diagonal step) in order to prune the set of local neighbours (tiles) around that node. The central idea is to avoid any neighbours that could be reached optimally from the parent of any given node. In this way we are able to identify and avoid, on-the-fly, large sets of symmetric path segments; such as those in Figure 1. RSR can pre-process most maps in under a second and has a very small memory overhead: we need to keep only the id of the parent rectangle each node is associated with (and the origin and dimensions of each such rectangle). By comparison, JPS has no pre-processing requirements and no memory overheads. Both algorithms are optimal and both can speed up A* by an order of magnitude and more. Figure 2 shows a typical example; For reference, I also include a screenshot for vanilla A*. You can click on each image to make it larger. All nodes marked red must be expanded before the optimal path to the goal (marked in blue) is found. Notice that, in the case of A*, many nodes on the fringe of the search (i.e. on the edge of the red area) can only be reached by paths that cross large regions of empty space. These paths usually have many symmetric alternatives and considering them all can require a substantial number of node expansion operations. RSR and JPS can detect and eliminate such symmetries and both reach the goal much sooner. Next time I will explain, in more depth, the mechanical details of both RSR and JPS. In the meantime, electronic copies of the research papers in which RSR  and JPS  were originally described are available from my homepage. If you have any questions or comments on this work, I’d be glad to hear from you. Please leave a message below or, if you prefer, drop me an email instead (my contact details are on the About page). Y. Björnsson and K Halldörsson Improved Heuristics for Optimal Path-finding on Game Maps. In AAAI Conference on Artificial Intelligence and Interactive Digital Entertainment (AIIDE), 2006. A. V. Goldberg and C. Harrelson. Computing The Shortest Path: A* Search Meets Graph Theory. In SIAM Symposium on Discrete Algorithms (SODA), 2005. M. Goldenberg, A. Felner, N. Sturtevant and J. Schaeffer. Portal-Based True-Distance Heuristics for Path Finding. In Symposium on Combinatorial Search (SoCS), 2010. N. Pochter, A. Zohar, J. S. Rosenschein and A. Felner. Search Space Reduction Using Swamp Hierarchies. In National Conference on Artificial Intelligence (AAAI), 2010. N. R. Sturtevant. Memory-Efficient Abstractions for Pathfinding. In AAAI Conference on Artificial Intelligence and Interactive Digital Entertainment (AIIDE), 2007. N. R. Sturtevant, A. Felner, M. Barrer, J. Schaeffer and N. Burch. Memory-Based Heuristics for Explicit State Spaces. In International Joint Conference on Artificial Intelligence (IJCAI), 2009.